The first name of James among popular musicians of the pre-punk rock era appears in retrospect to be somewhat of a poisoned chalice. Surely everyone is familiar with the cases of Jimi Hendrix and Jim Morrison, acclaimed superstars due to their envelopepushing talents, but in the quieter world of the troubadour or singer/songwriter, both Jim Croce and Jimmie Spheeris died violent but accidental deaths, Croce in a plane crash and Spheeris when a drunken driver knocked him off his motorcycle in Santa Monica on American Independence Day, 1984. However, it is probably more accurate to suggest that the poisoned chalice refers to those who abbreviated their correct name of James - James Taylor, for example, is still very much with us and has enjoyed a long and distinguished career which continues today. According to the best information available, James Spheeris was born on Guy Fawkes day (that's 5th November, for the uninitiated), 1949, in Phenix City, Alabama, a few miles west of the border with Georgia and around 200 miles north of Florida and the Gulf Of Mexico. His parents, Andrew, a Greek immigrant, and Juanita (whose nickname was Gypsy) owned and ran what Wikipedia calls "a travelling carnival called The Majick Empire", which probably inspired his often impressively poetic lyrics. He was one of four children, arguably the best known of whom was/is his older sister Penelope, who became a film-maker, among whose credits are the 1981 punk/rock documentary feature movie, 'The Decline Of Western Civilization', and its 1988 sequel, 'The Decline Of Western Civilization II – The Metal Years', which centred on the Los Angeles heavy metal movement, and included participation by the likes of Motorhead, Ozzy Osbourne and Aerosmith. She was also a writer for almost ten years on the TV series, 'Roseanne', and directed 'Wayne's World', the 1992 feature movie starring Mike Myers which grossed over $120 million! A 1986 Santa Monica newspaper article on Jimmie Spheeris revealed that his father was murdered by "a belligerent carnival-goer". after which Gypsy Spheeris moved the family to San Diego, then to Venice, California. By the late 1960s, Jimmie had left home and moved to New York, which he felt would allow him to further develop his chosen career as a songwriter. He became friendly with Richie Havens, probably after they had worked together, and Havens introduced him to Clive Davis, the big cheese at Columbia Records, who was responsible for signing Big Brother & The Holding Company (fronted by Janis Joplin), Santana, Bruce Springsteen, Blood, Sweat & Tears, Electric Flag (featuring Mike Bloomfield), Chicago, Laura Nyro (with whom Spheeris shared a New York City apartment around the time of his debut album), Billy Joel and several others - including Jimmie Spheeris, who was the beneficiary of a four album deal with Columbia/CBS. It probably didn't help Spheeris when Davis left Columbia in 1973, but subsequently Davis became the head honcho at Arista Records, to which he signed Patti Smith and Whitney Houston, among many others. Havens is one of several, also including Davis, who get "thank you" credits on 'Isle Of View', the earlier of the two albums which make up this reissue. In 1971, Spheeris was assigned Paul Leka as producer of this debut LP. Leka was not only a producer, but also a songwriter (of 'Green Tambourine', the million-selling 1967 US chart-topper for The Lemon Pipers, and of 'Na Na Hey Hey Kiss Him Goodbye', the million-selling 1969 US chart-topper by Steam, a studio group of which he was a member), an arranger and an orchestrator. As a producer, his credits included The Left Banke's Too'album, the first two albums by R.E.O. Speedwagon, and after working with Spheeris, three Harry Chapin albums. His expertise as arranger/orchestrator is evident on 'Isle Of View', although the excellent arranging and conducting work of David Campbell, who also played violin and viola, was similarly significant. Campbell appeared live with Spheeris "on special occasions" throughout the 1970s, playing viola and conducting when an orchestra was used onstage. However, perhaps even more significant was guitarist Geoff Levin, who appears on both the albums here, and was also in the Jimmie Spheeris Band until 1976. I haven't even heard the name Jimmie Spheeris for over 30 years i believe, and even in those days had only ever heard one song (which i couldn't remember)...thanks for the chance again Marios. Some truly magical moments in these grooves. Thank you Marios for posting this - Jimmie Speeris is forgotten in rock history. Thank you so much for sharing this! Jimmie Spheeris has indeed been overlooked and his records increasingly hard to find. I wasn't aware that this had been re-released. I hope perhaps there will be more to follow. First became aware of Jimmie when I heard "I Am The Mercury" playing on an FM station in 1972. Got to hear him live a year later. Truly an excellent musician and a great performer. His opening act that day was Jane Getz who did some bgv's on his lp's and had one of her own called No Ordinary Child. If you like Spheeris and can find her album, I think you'll like it, too. Saw Jimmie in Columbia, Mo. (Jesse Auditorium I believe) in 1975 I believe. One to the best shows ever. I was and am still a huge Jimmie Spheeris fan. His music is mystical even after all these years. He played in Kansas City on his birthday at the Midtown Theater. I still cherish the memories. His talent was remarkable and although I still have the albums, I was so excited to see these CD's. He only made 6 albums total in his career and I have all but his live sessions, which are unfortunately not part of the remixed, releases as they weren't under the Columbia contract. The cover is of the marquee the night of the very concert I went to, with his name in lights. 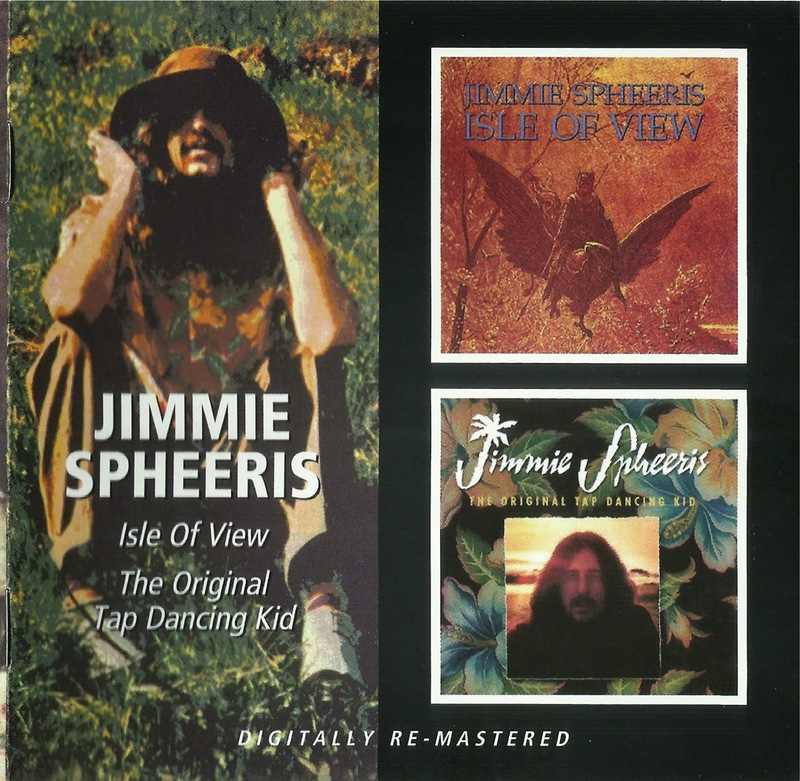 Jimmie Spheeris's LP Isle of View was a regular on the family turntable from 1972 when he had a couple of tracks on the great FM radio we heard in the midwest then. I still have at least 4 copies of the record because I buy every one that I see! I have played it many times over the last 25 years on my radio show in Tampa, Fl called The Dream Clinic on WMNF 88.5fm. I have the others as well but Isle of View remains my fav. Waooh.. i thought I had heard every obscure singer/songwriter from that era and now this jewel, which I am totally unfamiliar with! Thanks for teaching me a lesson and for discovering such precious music! I have about 2-3 hours of jimmie at the uptown theater circa 1976 from an fm broadcast if anyone is interested? Not a perfect show lots of broadcast problems but it's jimmie great loose and fun.